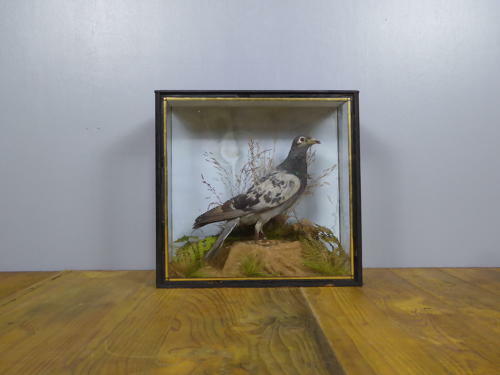 A beautiful early antique taxidermy racing / homing pigeon in a naturalistic setting. A charming & extremely well executed piece of late Victorian taxidermy, housed in an ebonized & glazed pine case typical of the period. Finished with a fine gilt trim around the front panel with the left leg of the pigeon retaining its original numbered identification ring. Wear commensurate with age, overall good, 'as found' condition. As is often the norm, the case has suffered a little over the years with the upper back & the original taped seams which surround the glass showing their age a little. The bird itself is in good order with some light dusting & mold to the face & wing tips which could easily be removed by a professional if required. Neither detract & the piece on a whole displays beautifully just the way it is. Collection in person preffered, UK courier service available at £15 tracked & signed for 24 hour delivery.